Our Body Pillow series provides your body with superior support, giving you the most comfort possible during rest and sleep in any desired position. 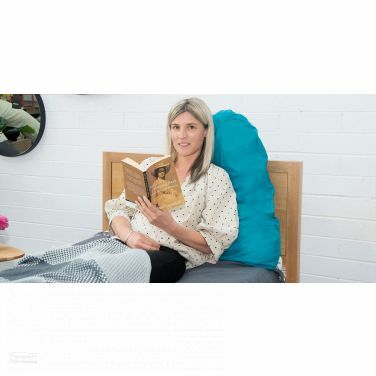 Designed and Made in Australia, our Body Pillows are the premium choice for all types and styles of unique sleeping positions. Equally as unique, the Body Pillows series is suited for individuals of all different shapes and sizes. At Pillows Australia, we are proud to provide our customers with an eclectic selection of body pillows made right here in Melbourne Australia. Designed by Australians and made in Australia, our full sized body pillows are all developed and produced to the highest health and well being standards the world over. Every single pillow we deliver has been specifically devised to conform to the human body, providing long-lasting comfort and support where it is needed most. The body pillows we offer supplement every day regular activities, from watching television to reading, snoozing, dozing, resting and sleeping. The full sized body pillows we supply, such as our reading pillows, our pregnancy and maternity body pillows, and our side sleeping pillows are all perfectly shaped and made to comfort and support the body in a variety of different positions. Our reading pillows ensure that the body and spine are softly supported in a relaxed upright position around the house and in the bedroom. Similarly our pregnancy and maternity body pillows gently conform to the body, providing strong cushioning support where the body needs it most, ensuring comfortable rest and sleep on the couch, sofa, or in bed. The human body is an intricate masterpiece of organic creativity that enables us to live and enjoy our day-to-day lives. Whilst being remarkable, our physical beings are fragile structures which often suffer from aches and pains such as lower back pain, neck pain, spine pain and stiff spine soreness, muscle aches or stiff limbs. Unfortunately, normal daily activities such as sitting at the office all day, driving and sleeping in the wrong position can all make our body's stiff and sore. When our body's are tired and run down, we cannot possibly function to the best of our abilities. As much as we shouldn't, we often take our body's for granted. Our goal at Pillows Australia is to help people find the support and comfort that their body's need and deserve. The exceptional range of body pillows and pregnancy pillows we offer have been meticulously developed to influence and sustain healthy sleeping habits, and to ensure that people can enjoy the best rest achievable. To help reduce neck and shoulder pain, to alleviate a sore back and lower back pain, to help reduce scoliosis and sciatica pain, to nurture stiff and tired muscles or to simply have comfort and support whilst resting and relaxing during activities that you enjoy most, our body pillows are for you. Rest Better, Sleep Better, Be Better.